"I think we would turn it off if we could," former game designer Jay Wilson said regarding both the gold and Real Money Auction Houses. Diablo III was a very underwhelming game to many long-time fans of the classic dungeon crawler. The obvious reason was Blizzard's much touted Auction House feature, which allowed players to sidestep actually playing the game to collect items, and instead stare at spreadsheets for hours determining if an item was both an upgrade and a "good deal". Despite overwhelming player complaints that the Auction House went against the spirit of the game, Blizzard insisted that it was a necessary feature. But it now looks like former game director Jay Wilson has admitted defeat, telling Joystiq that both of Diablo III's Auction Houses "really hurt the game." He says that Blizzard grossly underestimated how players would utilize the Auction Houses. He thought they would help reduce fraud, that they'd provide a service to players that they wanted, that only a small percentage of players would use them, and that the price of items would limit how many were listed and sold. Boy was he wrong, especially on the last two points. 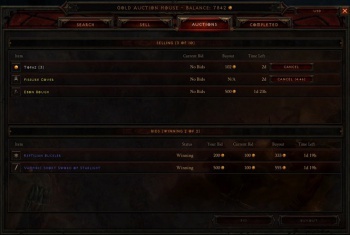 Almost every one of the game's players made use of an Auction House, and 50% of all players use one "regularly". Wilson says that the game still has a daily player base of around 1 million concurrent players, with 3 million per month. He says the problem is that the Auction Houses made money a much higher motivator than actually, you know, killing Diablo. This damaged the reward of actually finding items in the game, because why spend hours farming bosses for random loot when you can go on the Auction House and find exactly what you need? The majority of Auction House hate is directed towards the Real Money Auction House, which many players saw as a shameless revenue raiser for Blizzard, but Wilson explains that "gold does much more damage than the other one does," because more players use it and prices fluctuate much more. "I think we would turn it off if we could," Wilson admitted, "but the problem is not as easy as that." He says that Blizzard has no real idea how many players actually enjoy the feature, and he doesn't want to remove something that some players might like. That said, he says that the team are working on a "viable solution" to the Auction House problem, but stopped short of actually explaining what it would be. I really think nothing short of turning the Real Money Auction House off completely, and substantially increasing loot drops as well as making the blacksmith much more viable (like they have started to do with the Infernal Machine and Demonic Essences) will "fix" the Auction House problem.